Promotion of your business on Daventry Business website, as much information as you want on it and changeable at any time. Your logo on our banner at every game. Your logo on our banner at every event plus meeting during the year. (Banner or Stand up Banner). Your logo on all leaflets about the events. Front of programmes etc. 2 VIP Tickets to every match which includes free meal (Buffet or Hot meal). Signed shirt or ball from any match you chose. Continuous promotion of your business through FB and Twitter etc. Leaflets etc to hand out on match days and events of your latest offers etc. We honestly believe that you will also get the added kudos of being part of these events, which have grown in stature over the years. 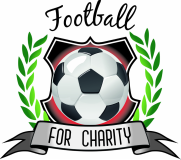 You will be helping FOOTBALL FC raise money for your community, causes and charities. FIND OUT MORE ...Use our contact form. Information on Silver and Bronze packages will appear shortly. Most of the elements are standard on all three packages. Prices differ for all three packages, but we will promote all businesses vigorously through these pages, Daventry Business website and through our programmes.